Unlike base metals like zinc or copper, there isn’t a supply problem with aluminum, per se. That is, aluminum is a plentiful metal. Bauxite, aluminum ore, is the primary source of aluminum. It’s nearly all that remains when you weather granite mountains into clay. Bauxite is common in the tropics. According to the U.S. Geological Survey, there are between 55 billion to 75 billion tons of bauxite resources around the world. Countries like Guinea, Australia, Vietnam, Jamaica and Brazil hold the most mineable reserves. Aluminum prices hit a record low in November 2015. At $0.65 per pound, aluminum was the cheapest since the crash in 2008, and near the bottom of the last bear market in 2003. Since then, it’s up over 50%. This is the surprise bull market of the year. Typically strip-mined at the surface, the cost of aluminum is in the processing. You see, bauxite is aluminum rust. The metal bonds with an oxygen atom, which is difficult to break. You have to heat the bauxite to 3,632 degrees Fahrenheit to melt it. That’s much higher than carbon steel (2,800 degrees Fahrenheit) or titanium (3,040 degrees Fahrenheit). Once the aluminum oxide melts, they use electrolysis to separate the pure metal. The process needs an enormous amount of energy. That’s far and away the largest cost of producing aluminum. It’s so expensive that many producers ship bauxite all the way to Iceland to use geothermal energy for the process. Iceland charges big aluminum smelters about 30% less for electricity than they would pay in the U.S. That’s why Iceland is on pace to produce more aluminum than the U.S. this year. The world’s largest center of aluminum production is in China. China Hongqiao Group is the world’s largest aluminum producer. According to giant aluminum producer Alcoa Corp. (NYSE: AA), the aluminum market is in balance. China runs a 2.2 million metric ton surplus, while the rest of the world needs 1.9 million metric tons. Demand is up a modest 4.75% to 5.25% in 2017 (from 2016). 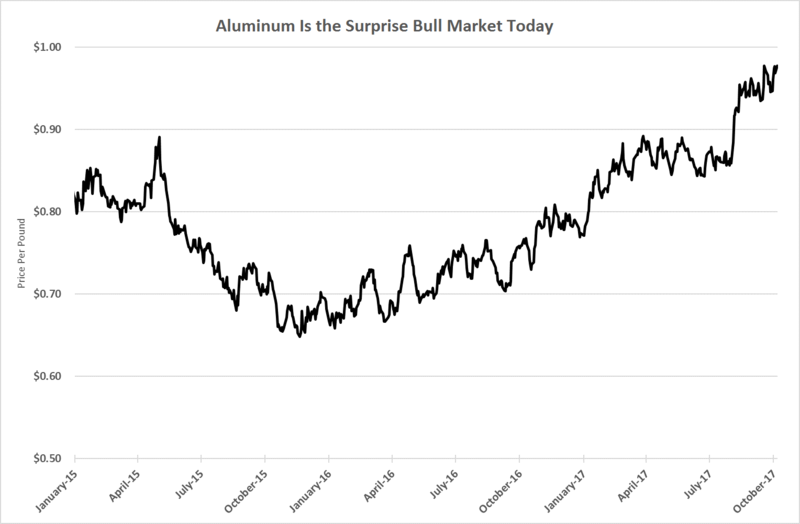 The bull market in aluminum is in place. At $0.97 per pound, it is well below its peak of $1.24 per pound from 2011. This sector could produce more gains before supply finally overwhelms the price. However, we should be vigilant if we do put money to work here. The bull market could turn on news out of China, which we can’t predict. Use a tight stop and prepare to get out quickly. « Previous Google’s Buying Apple?